The History of the Latin Christendom in the Near East is tightly connected with the First Crusade. The Byzantine Empire, facing the ever growing threat of the Seljuk Turks as a military and dominant force in Asia Minor, in what was known as Anatolia, turns to Pope Gregory VII, who, in 1074 called for the "milites Christi" (soldiers of Christ), a call to aid the Byzantine Empire in the east, which was largely ignored. Later, it’s Pope Urban II who makes an appealing speech to the European nobles to participate in a holy war against the foes of Christ and to retake the Holy City of Jerusalem, because "Deus vult!" (God wills it!). Soon charismatic speakers take on the lead and start preaching in several points in Western Europe, exponentially raising the fervour, zeal and inspiring several people and nobles into a Holy War. In the year 1095 the First Crusade is launched. 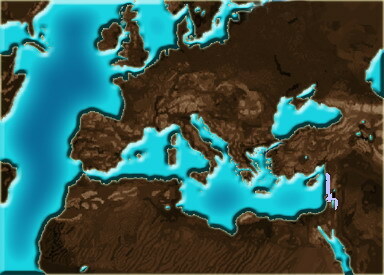 Through a successful series of campaigns, the Christians are able to take several important key points in the Levant and forming the Crusader States, namely the County of Edessa, the Principality of Antioch, the County of Tripoli and the Kingdom of Jerusalem.By order of the Pope the Crusaders were sent to free Jerusalem from the infidels, although their goal was achieved, in order to maintain it several Christian states were created so that the conquered territories remain under Christian rule, yet they quickly found themselves as the ones surrounded by enemies. As a newcomer in the Middle Eastern game and considered an invader by most kingdoms that already exist here, you will find your diplomatic relationships with most kingdoms of this region quite deteriorated. While commanding the Crusader States, you will have a hard time dealing with your neighbours, as you will find yourself surrounded by kingdoms which are almost certain to become your enemies. In order to increase your chances of survival it would be best to ally with the Byzantine Empire, yet the only way you are to secure and further strengthen your position is through conquest and this will most likely involve direct conflict with the several Muslim kingdoms around you, who do not welcome your presence here. While your intentions are of conquest, so are those of your neighbour kingdoms and thanks the unfortunate fact that the military strength of the Crusaders States is lower than those of it's surrounding kingdoms, it may ironically very well make them the ones to be first struck and under risk of conquest, not the opposite. Made up from France's nobility, these elite warriors are as deadly on foot as when mounted. Knights in training hailing from the County of Edessa. Equipped with light armour, shield and a mace. Reliable heavy infantry.